Birdseed is a mixture of seeds, nuts, fruits, and vegetables provided to birds for sustenance. It is produced in a two-stage process that involves preparing the component ingredients then combining them in a mixing kettle. Statistics show that the United States is a nation of bird lovers. In fact, feeding and watching birds has become one of America's favorite pastimes. According to the United States Fish and Wildlife Service (USFWS) one third of the United States population feeds wild birds. In a survey done by the American Pet Products Manufacturers Association (APPMA) it is reported that 6.9 million households in the United States have birds as pets. This fascination with birds has led to a birdseed industry that dispenses over 500,000 tons of birdseed per year. Humans have a long history of interaction with the avian world. As far back as the Egyptian pharaohs and the ancient Romans, people captured and kept birds for both aesthetic and practical reasons. Certainly, modern society continues to depend on birds for food, entertainment, and companionship. In light of this, then, it is not surprising that the United States Congress enacted the Wild Bird Conservation Act of 1992 in an effort to preserve exotic and endangered birds around the world. Even with such a rich history of interaction between humans and birds, birdseed manufacturing did not get its start until the middle part of the nineteenth century. Many of today's American birdseed manufacturers have similar roots; they were small town agricultural grain companies with retail stores. In the 1940s, Simon Wagner of Wagner Brothers Feed Company and Bill Engler Sr. of Knauf & Tesch (the company is now known as Kaytee, one of the largest pet food manufacturers in the country) collaborated on creating a market for wild birdseed. Up to that point such a market had never existed. Creating birdseed was a natural extension for these feed companies considering they were already making products that contained the same ingredients. Wagner and Engler were able to establish a market for their birdseed relatively quickly. Wagner attributes the early success to the growth of suburbia after World War II, which led to new homeowners' interest in their yards and the animals that visited them. The most commonly used birdseed ingredients are sunflowers, corn, millet, fruits (such as raisins and cherries), and peanuts. Many of these crops come from Nebraska, Kansas, North Dakota, and South Dakota. One of the primary ingredients in birdseed is sunflower seeds. These are four sided, flat seeds that are about 0.25 in (0.64 cm) and 0.13 in (0.32 cm) wide. The seed coat is black with gray stripes. The outer coat protects the inner kernel which is composed of about 20% protein and 30% lipids. It also contains a significant level of iron and fiber. Other seeds that may be used include cottonseed, pumpkin, safflower, hemp, or palm kernel seeds. Cereal grains are another type of ingredient used in birdseed compositions. Of these corn is one of the most important. About 800 kernels are produced for each ear of corn harvested. An average center kernel measures about 0.15 × 0.31 in (4 × 8 mm) thick and 0.5 in (12 mm) long. Corn kernels are made up of about 60% starch and 4%oil. Millet is another grain used. It is smaller than corn with a length of about 0.15 in (4 mm) and a width of 0.11 in (3 mm). It contains about 11% protein, 3% fat, and 8%fiber. Its small size makes it an ideal birdseed ingredient, especially for smaller birds. Peanuts are a groundnut grown on an upright plant. Its flowers are fertilized above ground and then are pushed into the ground to develop the seeding pods. A pod will contain anywhere from one to three nuts. Peanuts are good components for birdseed because they contain over 25% protein. Additionally, they have about 50% oil which increases their taste appeal for birds. Manufacturers must be particularly careful of any birdseed mixes that contain peanuts because peanuts can harbor the pergillus mold. This mold can do serious liver damage to birds. Fruits are another component material added to birdseed mixtures. They have a high sugar content that makes them appealing to certain bird species. The most commonly used fruits are cherries and raisins. Cherries are pitted before they are used and then dehydrated. Raisins are produced from grapes using a drying process. They can be either sun-dried or physically dried by forced-air dryers. In general, pet bird food is a more complex mixture including exotic nuts and fruits. This is because pet birds get all their nutrition from the bird feed that is given to them by their owners; unlike wild birds that have access to and utilize other food sources. Another interesting additive to some wild birdseed is ground hot peppers. It turns out that birds do not mind the hot pepper taste but squirrels have a distinct aversion to it. This prevents squirrels from eating birdseed laid out for wild birds. Other ingredients such as algae extract can be added to improve the tone and color of a bird's feathers. Making birdseed is a relatively simple manufacturing process. The first phase of production involves the procurement of seeds, grains, and fruit that make up the various mixes from processors. The second phase involves blending and packaging these materials then shipping them to consumers. 1 The process of producing birdseed begins with the procurement of raw materials. This is an important phase of production because pure and fresh ingredients are crucial to the quality of the end product. Birdseed manufacturers purchase their raw materials from processors who obtain their grain from the actual growers or grain brokers. 2 The processors clean the component seeds to get them to 98% purity. Once the raw materials are in the plant, they must be cleaned further. The cleaning process consists of sorting unwanted debris and waste products from the birdseed ingredients. Typically the raw materials are put through a three-step air cleaning system that sorts the quality foodstuff from the waste (also known as Chilton). The air sorter separates the lighter debris such as sunflower hulls and stems from the raw materials used in the birdseed mixes. Many manufacturers use the Chilton to make other animal feed such as pellets for companion birds. Additional waste products may be sold to local farmers for use in their animal feed. Dirt and rocks can also be removed with a similar process. Processors may also provide drying services and some seed treatments to prevent fungal growth. 3 Once the seed is cleaned and treated, it is filled into bags, drums, or even trucks and delivered to the birdseed manufacturer within one week. Larger manufacturers are often geographically located near processing companies that clean and store the crops used to make birdseed. 4 Next, the cleaned seeds are blended. Recipes vary depending on the mix, but all ingredients are automatically measured and blended in large, stainless steel containers. In an effort to keep the mixes blended and consistent from package to package, the ingredients are continually mixed until they are deposited into their appropriate packaging. Occasionally, scents, oils (such as anise or orange oil), or colors are added to the blends to enhance consumer appeal. 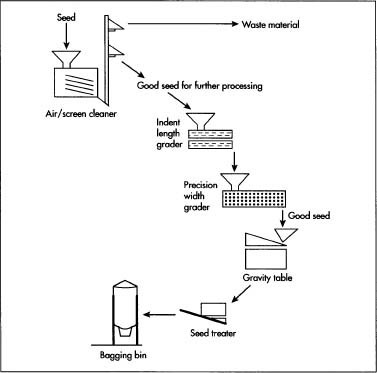 The manufacturing process of birdseed. 5 Proper packaging is crucial to the quality of the birdseed because rodents, mites, or other pests can contaminate seeds which in turn can be spread to birds. Packaging equipment weighs and fills pre-made packages composed of a variety of materials from paper to polyester films. The packaging provides a physical barrier between the feed and potential pests. As a general rule, companion birdseed typically gets more barrier packaging than wild birdseed. 6 To minimize infestations by any pests that may have inadvertently gotten inside the bags after packaging, each bag is flushed with nitrogen. The moisture and oil content of the grain also has an impact on the potential for infestations. Seeds with high oil and moisture content, like sunflowers, require more treatment to prevent infestations or rancidity. Another tactic for cutting down on infestation is to use airtight bins to house the birdseed ingredients prior to it being processed. To ensure that a high quality product is made, birdseed manufacturers visually inspect the raw materials and finished products during each phase of production. Quality control begins with the raw material growers. For example, the plants are frequently examined while they are growing to make sure they are free from disease and growing properly. If diseased plants are found, they may be isolated and removed before harvest. When the birdseed manufacturers receive component raw materials inspections begin immediately. These ingredients are subjected to a variety of laboratory tests to ensure that specifications related to seed size, nutritional value, and microorganism contamination are met. After batches of birdseed are mixed, the finished product is checked to see that the correct proportions of ingredients were put in each batch. Perhaps the biggest issue facing birdseed manufacturers in regards to pet birds is the trend in avian nutrition to move away from birdseed as the main source of nutrition toward pelleted food. Pelleted food is touted as being "complete nutrition" and, according to manufacturers, no additional supplementation is necessary. Manufacturers recommend using birdseed as a treat or behavior modification tool instead of the bird's mainstay. The advantage of pelleted food over birdseed is that it provides a bird with all the necessary vitamins and nutrients required for optimum health. Of course, the drawback to pelleted food is that some birds refuse to eat it. Birdseed is inherently deficient in some important nutrients like protein and some minerals and high in fat (up to 50% fat in some seed). In the future, birdseed manufacturers will try to formulate more mixtures with a more complete nutritional profile. Another trend in the industry is to make the industry as a whole more proactive and homogeneous. Overall, the bird feed industry is relatively fragmented with cottage-based industries to massive corporations all producing birdseed. As a result, different states have different regulations and expectations for quality control. Industry trade associations have been attempting to deal with the quality control issue on many levels including an attempt to standardize regulations and expectations from state-to-state. Additionally, efforts are underway to educate the entire industry on issues affecting it, such as noxious weed control in crops. Alderton, David. The Cage Bird Question and Answer Manual. Barron's Publishing, 2000. Armstrong, Holly, et al. Gourmet Bird Food Recipes. San Leandro, CA: Bristol Publishing, 2001. Gallerstein, Gary A. The Complete Bird Owner's Handbook. Macmillan Publishing, 1994. Allen, Carolyn. "We Have Roots: Early History of the Wild Bird Seed Marketplace." Birding Business (Summer 2001). Rouhi, A. M. "Chili Pepper Studies Paying Off With Hot Birdseed and Better Analgesics. Chemical and Engineering News (4 March 1996). American Pet Products Manufacturers Association Web Page. December 2001. < http://www.appma.org >. Kaytee Products Web Page. December 2001. < http://www.kaytee.com >. How is bird seed sunflower seed different from human consumption sun flower seed? I've considered eating sunflower seeds for birds because it looks like a better buy, pound for pound.